This is one of those sets that could drop off the face of the planet and very few collectors would care. Fleer/Skybox’s 1996 Emotion-XL set consists of 301 cards. 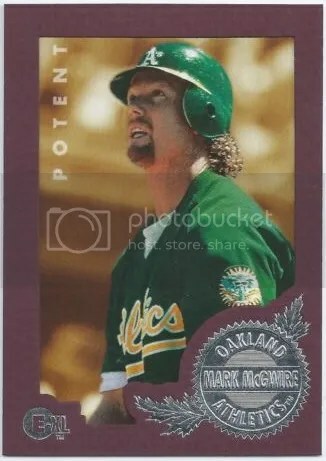 That’s if you count the Manny Ramirez promo that was sent out to distributors. Out of all those cards, there is only one rookie and that is of Osvaldo Fernandez #289. I’ve never heard of Osvaldo Fernandez so its probably safe to say that he didn’t quite make it. Every base card comes with a stylized frame around it. They easily remind you of the Diamond Kings products Donruss once put out. The frame colors have nothing to do with scarcity. No certain color is rarer than another. The base cards also come with a word printed on the photo which is suppose to describe that player. Many of these words probably wouldn’t apply to some of these guys today. Outside of the base cards, this set does have a handful of inserts to look for – D-Fense (1:4), Legion of Boom (1:36), N-Tense (1:12), and Rare Breed (1:100). Very few of these cards hold any value. In fact, the only card that might hold some value is #90 and that’s of Derek Jeter. You’ll find a lot of collectors trying to pawn that card off as a rookie, but we all know Jeter’s true rookies come from 1993. Boxes can be bought for $25.00.